At Washington, D.C., Hon. GEORGE G. KING, member of the House of Representatives from Rhode Island, to Miss ELIZABETH SEAVER." 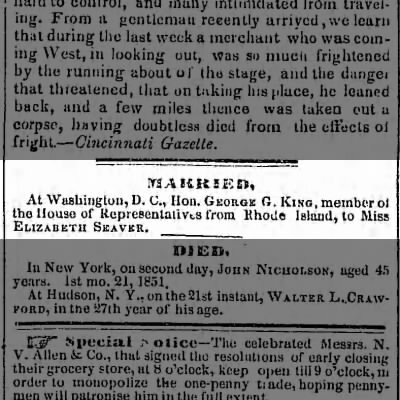 "Married," marriage announcement, The Brooklyn [N.Y.] Daily Eagle, 22 January 1851, page 2, column 5, George G. King and Elizabeth Seaver marriage; digital image, Newspapers.com (http://newspapers.com : accessed 9 August 2017). Reader Barbara sent this marriage notice to me and it sent me scurrying to figure out who Miss Elizabeth Seaver was. I did not have a candidate for a person by that name who resided in Washington, D.C. at that time in my RootsMagic file. So I went searching, and found an 1850 U.S. census record for Johnathan Seaver (age 55 born in MA) with a Johnathan Seaver (age 22 born in DC) and an Elizabeth Seaver (aged 22 born in DC), in Washington, D.C. I easily found Jonathan Seaver (1793-1864) who married Mary G. Plummer on 5 June 1823 in Washington, D.C. This record identifies three children of Jonathan Seaver dated 1845, which includes Elizabeth Seaver, "died 10th mo. 22 d 1853," who joined the church with Jonathan in 1845. There is a Find A Grave memorial for George Gordon King also, he died 17 July 1870, and is buried in Island Cemetery in Newport, Rhode Island also. There is also a Find A Grave memorial for the baby daughter of George and Elizabeth (Seaver) King - named Elizabeth Seaver King (1852-1853). There is also another Find A Grave memorial for Elizabeth C. King, who died 26 October 1853, in Congressional Cemetery in Washington, D.C.
My judgment is that all of these records refer to Elizabeth C. (Seaver) King (1826-1853) who married George Gordon King, a member of Congress from Rhode Island, before 22 January 1851 in Washington, D.C. Unfortunately, all of the known children of Jonathan Seaver died before 1853, leaving no living issue. None of these children of Jonathan Seaver were in the FamilySearch Family Tree before this exercise, and now they are. "The Brooklyn Public Library makes the Brooklyn Daily Eagle free to everyone at https://bklyn.newspapers.com; you don't need a Newspapers.com subscription to read it."